Be careful, I think you'll find this useless in most cases. It's only usable when the video card has the special dvi connector that also incorporates analog connections. Connects computers with a DVI video card to VGA monitorsI think you'll … Connects computers with a DVI video card to VGA monitorsI think you'll find it's the other way round. @ Pauljameswright. DVI-I Is standard on pretty much every video card, and has been for years. Be careful, I think you'll find this useless in most cases. It's only … Be careful, I think you'll find this useless in most cases. It's only usable when the video card has the special dvi connector that also incorporates analog connections. True. They are useless in most cases as most video cards don't incorporate this. No, they are right. @ Pauljameswright. DVI-I Is standard on pretty much … No, they are right. @ Pauljameswright. DVI-I Is standard on pretty much every video card, and has been for years. I realise that, but the dvi and vga signals are not interchangeable. You'd need to have an actual converter box and this this thing is NOT a converter. Some pcs/cards have a sort-of combined dvi/vga port which has extra pins in addition to the standard dvi ones. All this adapter does is to wire those pins into standard vga plug on the other end. Unless I'm misunderstanding...? All the pcs where I work are obviously still dvi-d and so is my home pc. 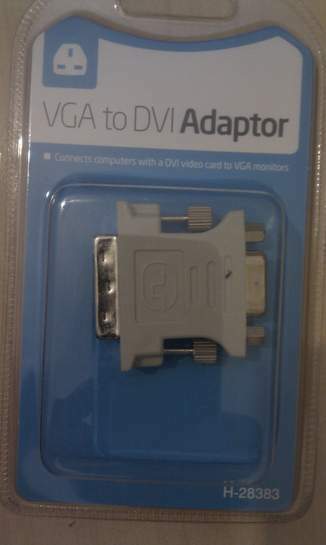 When someone at work needed to plug a vga monitor into his dvi port we tried one of these adapters and found it had pins where we had no holes! Couldn't determine who the manufacturer is other than the ITP Imports brand and a plug socket symbol in the top left hand corner. The website where they get these things whole sale doesn't identify the actual manufacturers/makers name.